There are settings that affect the visibility of individual Posts or Pages which are explained as part of the section on how to create posts and pages. You can temporarily restrict access by putting up a Under Construction or Maintenance Mode page. The settings that effect access to the site as a whole are described here. These site visibility settings are accessed from your site dashboard under Settings > Reading at the bottom of the page. 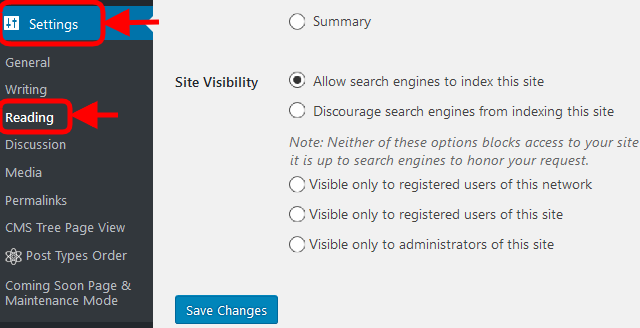 These Site Visibility options are ordered from most visible, “Allow search engines to index this site”, to least visible, “Visible only to administrators of this site”. Allows search engines to index your site content and return your site as a related search result. You would use this setting when you want people to find your site. This would be politely asking search engines to not return your site as a related search result but does not prohibit access in any way. It is up to search engines to honor your request. This will override any page or post specific visibility settings.